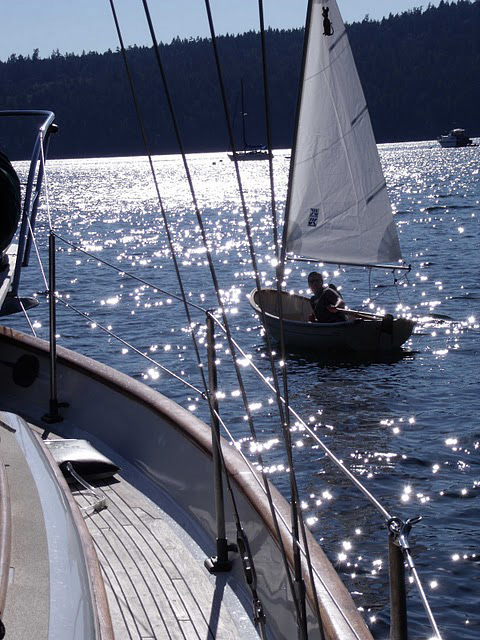 This is our sailboat, Saviah. 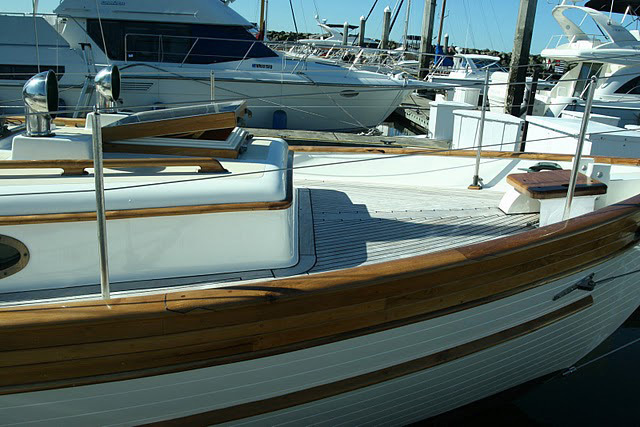 She is a Bob Perry designed Hans Christian 34 cutter that was built in 1976. We purchased her in August 2006. She had been neglected for quite a while, so we knew we had a lot of work ahead of us. 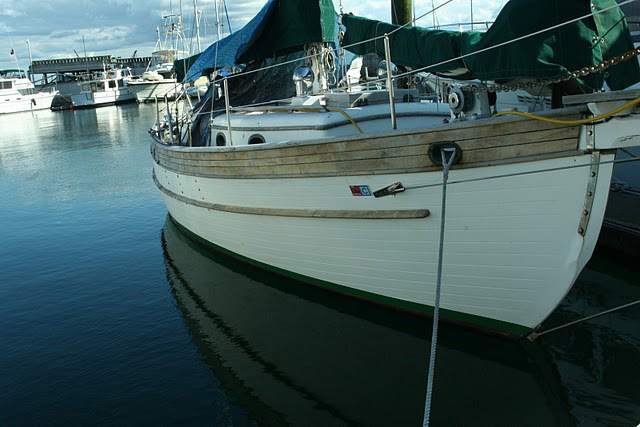 We hauled her out of the water right after we bought her and she spent the next five months in the Ballard boat yard. 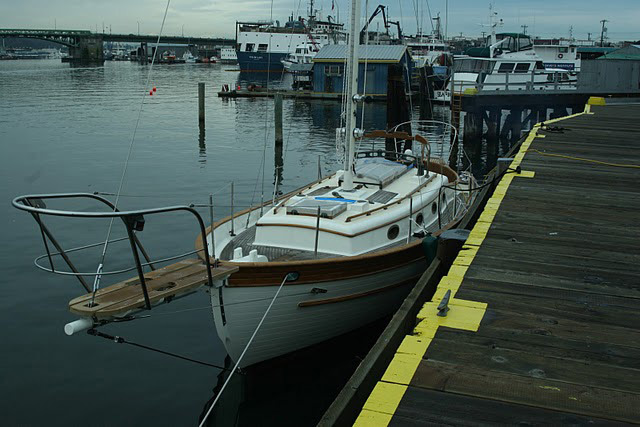 The first time we saw her in the Tacoma marina. 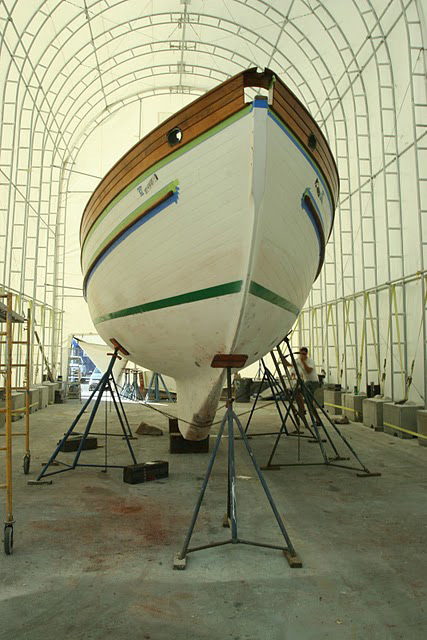 Lots of sanding and varnishing ahead of us, but she was structurally sound. 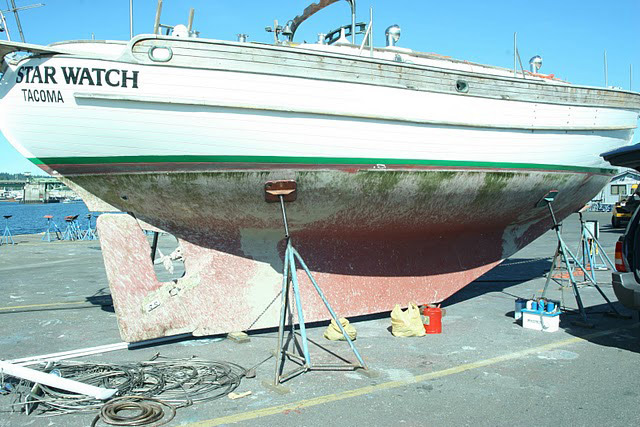 We just arrived in the Ballard boat yard and began removing all of the barnacles and grinding off years of bottom paint from the hull. 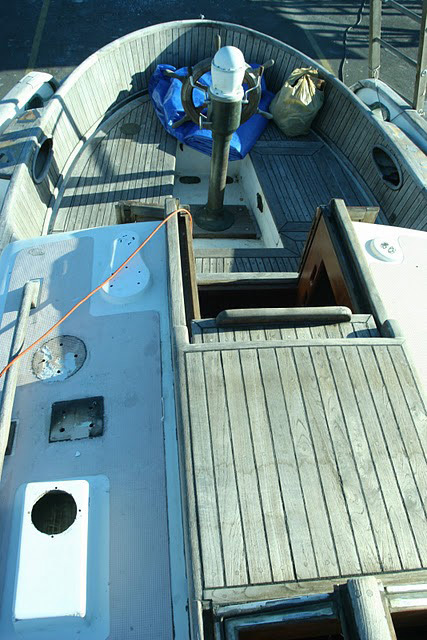 We're down to the fiberglass on the bottom and ready to start painting. 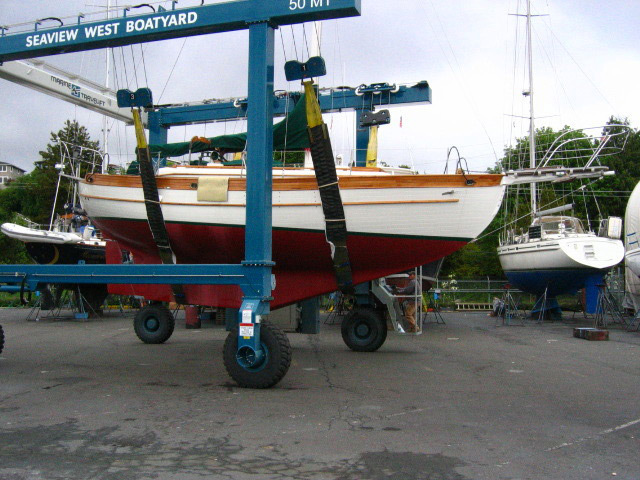 We removed all of the deck hardware so we could paint the topsides. We also ground down all of the nonskid surfaces and reapplied a new nonskid surface. 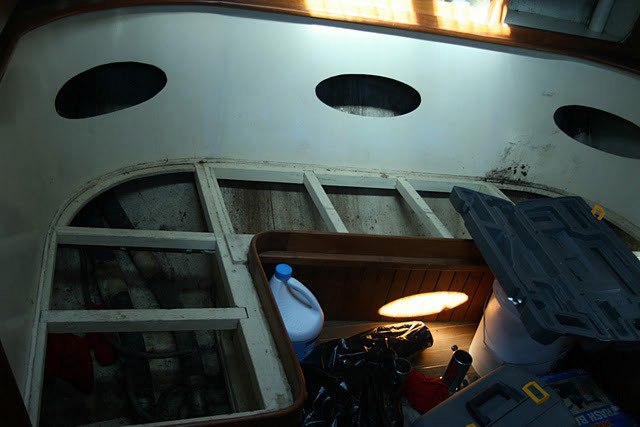 All of the old caulk needed to be removed and replaced before we starting sanding the teak. A messy job. 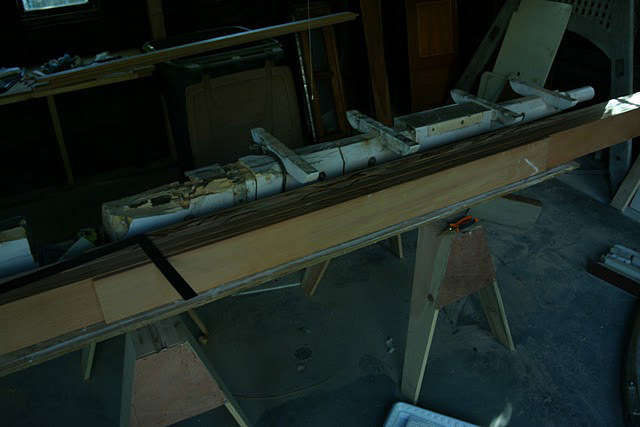 The original 11' long bowsprit had split and was rotting. 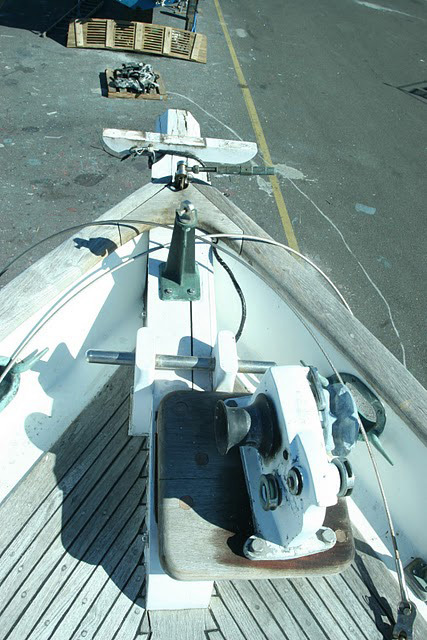 Cutting the bowsprit off was one of the first things we did. 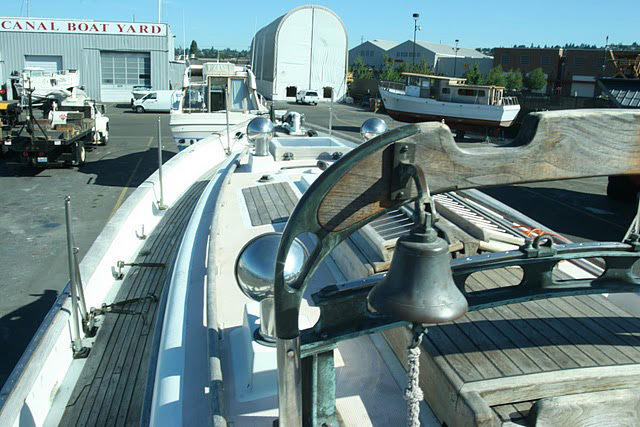 You pay by the foot at the boat yard and having that off saved a bit of money. 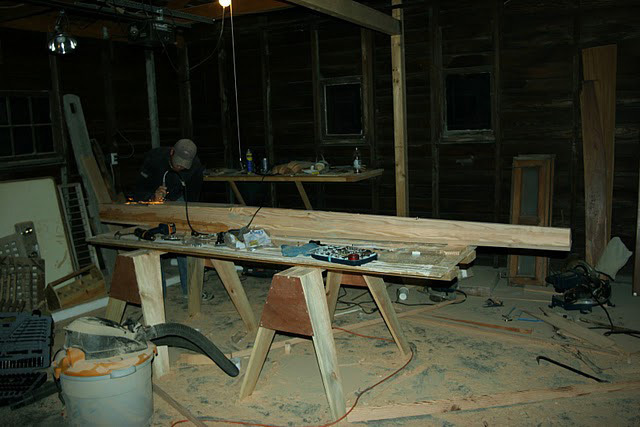 We moved the bowsprit to the garage and began making a new one. 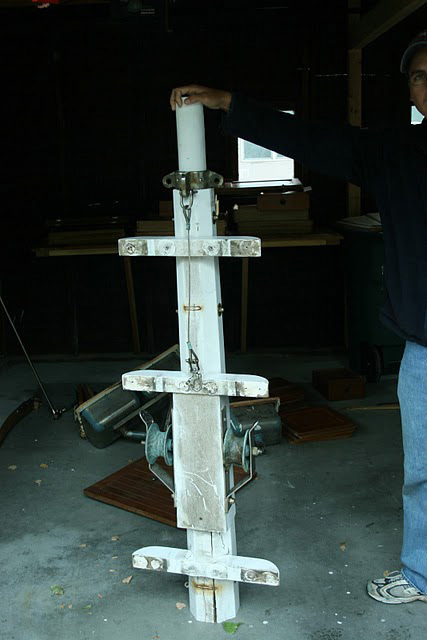 We ended up having to cut it up in a dozen or so pieces to get it off the boat. We forgot to take measurements before cutting, so here we are attempting to piece it back together again so we can recreate it. 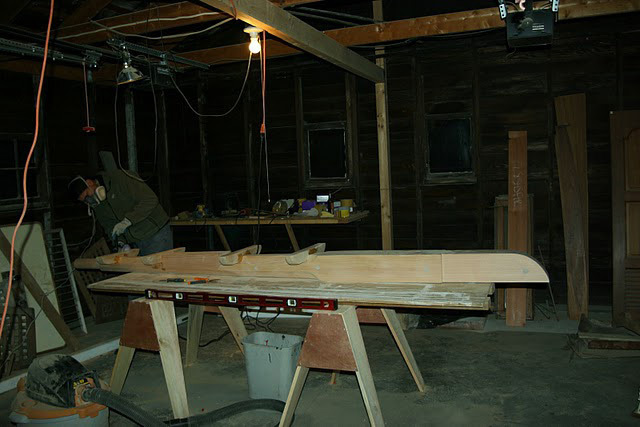 We've laminated 6 fir 2X8's together for the replacement. 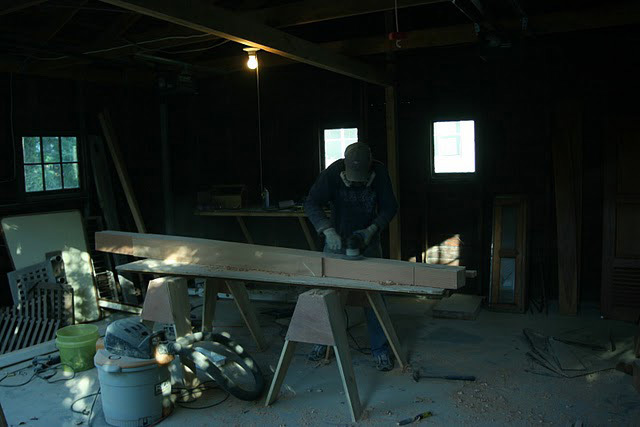 In addition to gluing it, we bolted the pieces together for additional strength. I'm grinding off the bolt ends here. 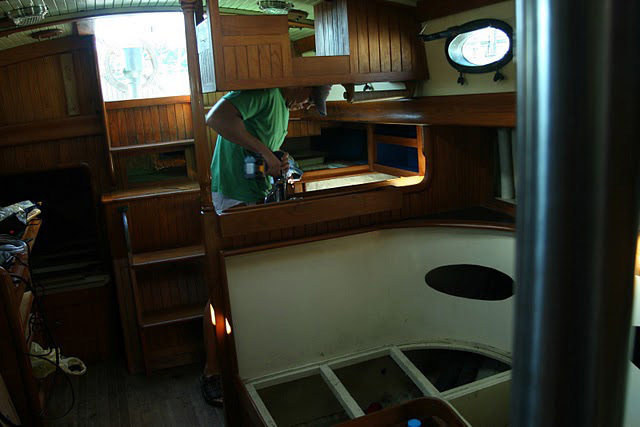 Doing some final sanding before we take it back to the boat yard and paint it. 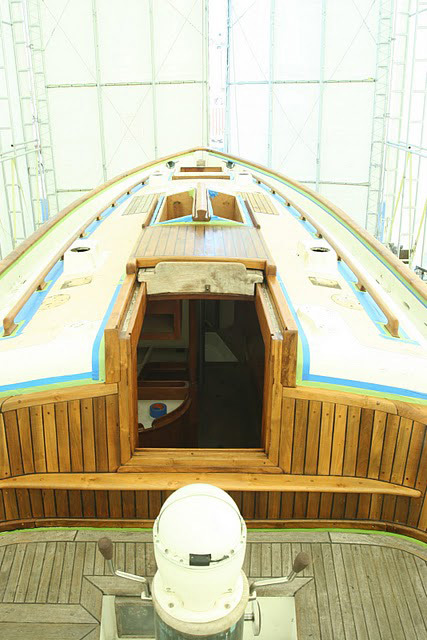 We've sanded the exterior teak and are now applying the varnish. Three coats down, six more to go. 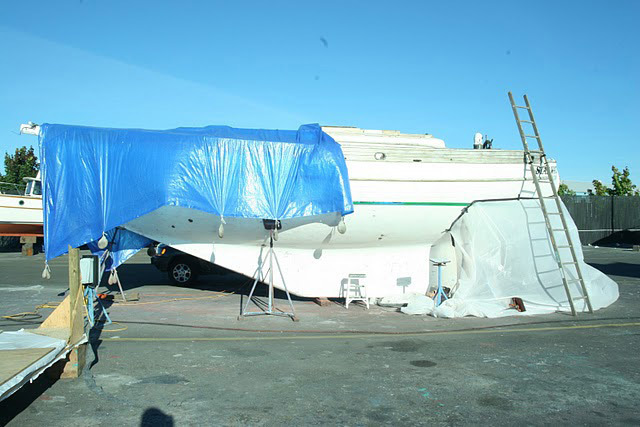 After the varnish was done, we had the hull, topsides and bottom paint done. 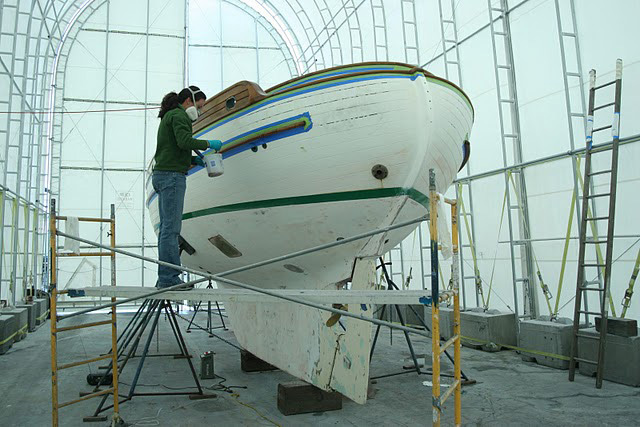 She is looking like a new boat. 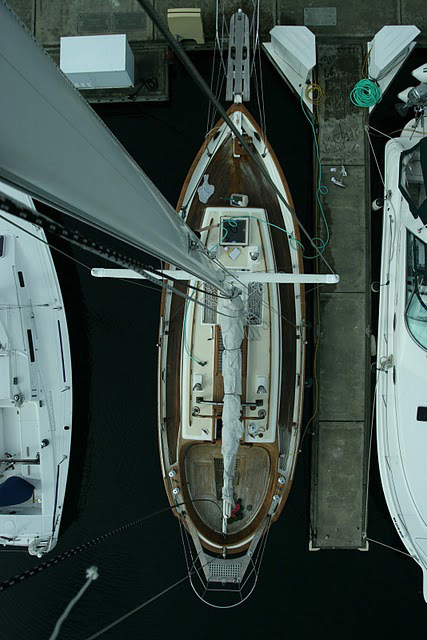 Back in the water after five months in the boat yard. 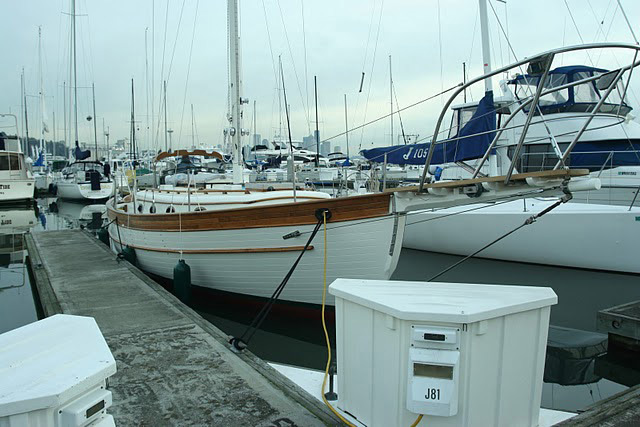 And finally to Elliott Bay Marina where she will sit for the next few years while we finish the exterior details and work on the interior. 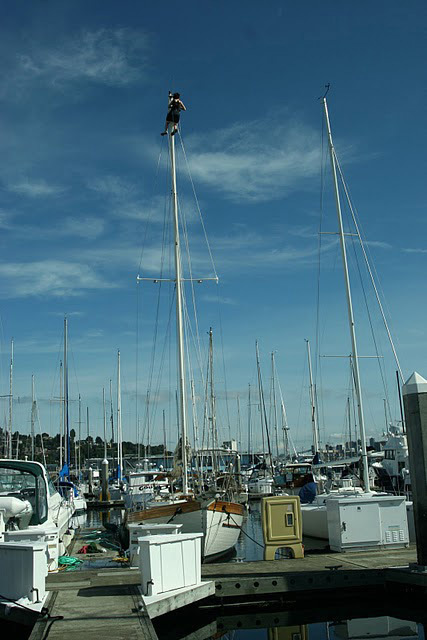 Here is Di at the top of the most installing the new halyards. The exterior is done, now we move to the interior. 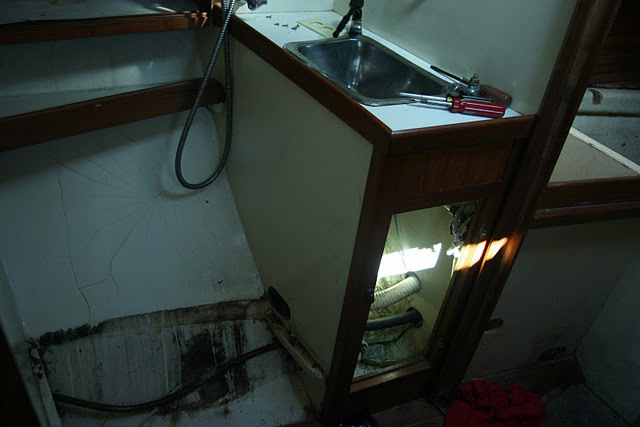 We removed all of the original plumbing and wiring. 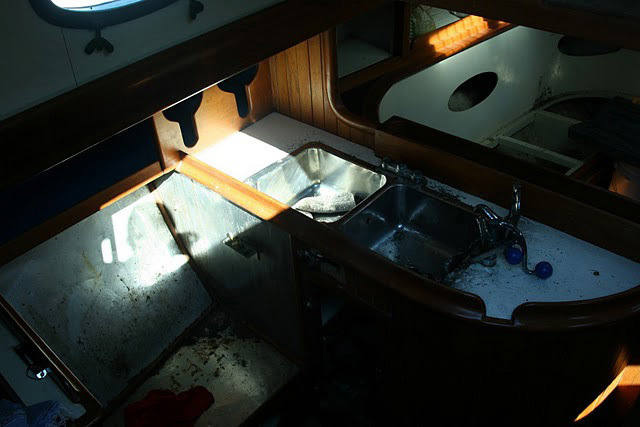 Cutting out the old galley sink. Removed the original head (toilet). 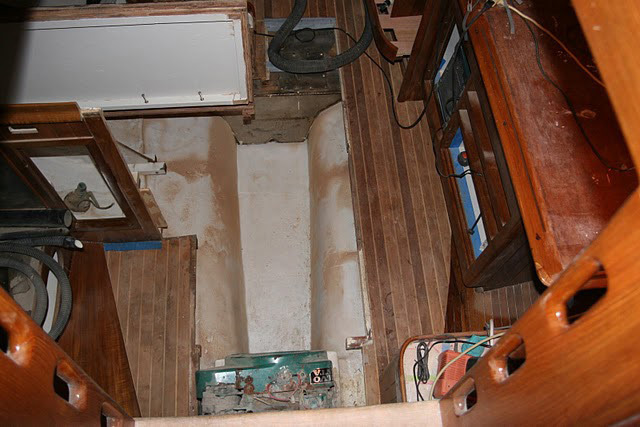 We had to remove the galley cabinets and some of the cabin sole (floor) to get the old fuel tank out. The original volvo engine which would soon be replaced. 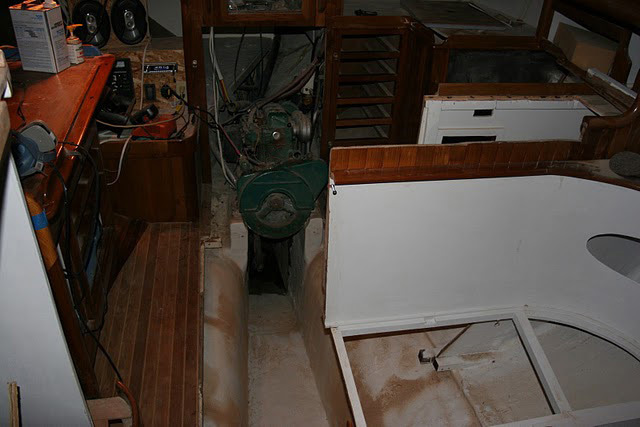 A few years later, we're finished with the interior. 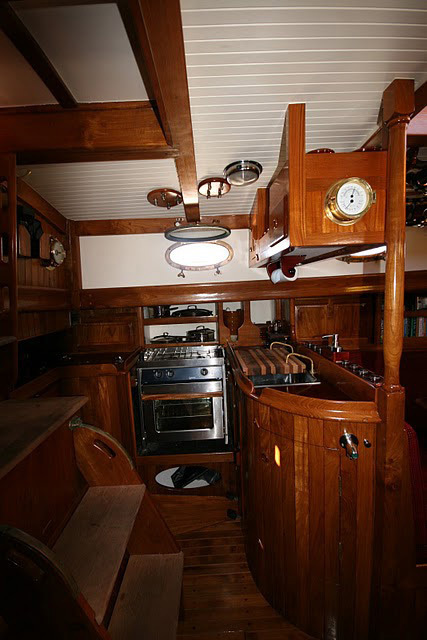 All of the surfaces have been painted and varnished. New fixtures and appliances have been installed. 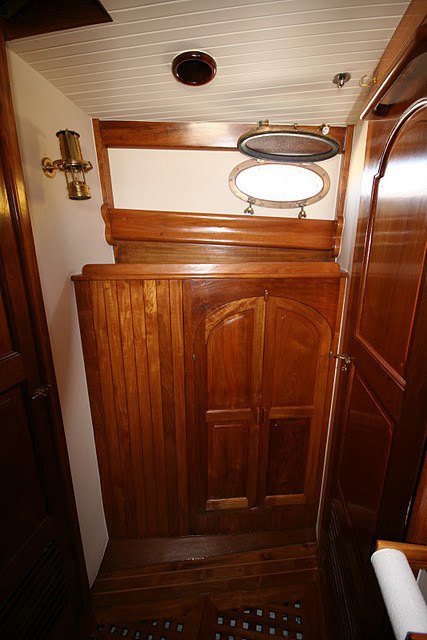 This is the hanging closet (right), the v-berth (center), and the doors to the head (left). 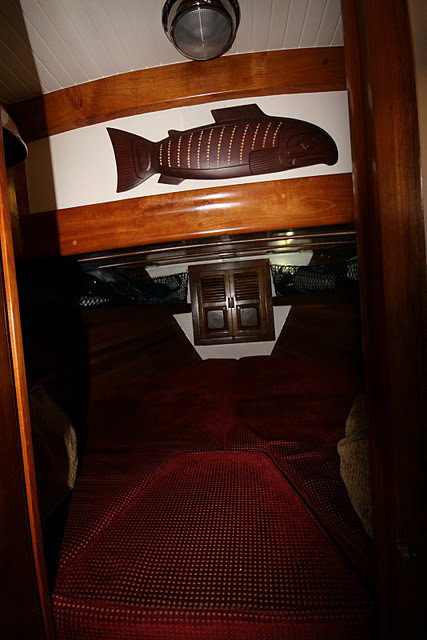 The v-berth is the bunk all the way forward in the boat. 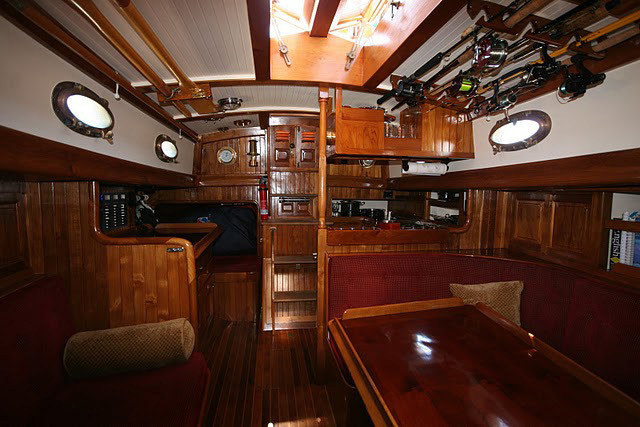 This is where we sleep when we are at anchor or in the marina. 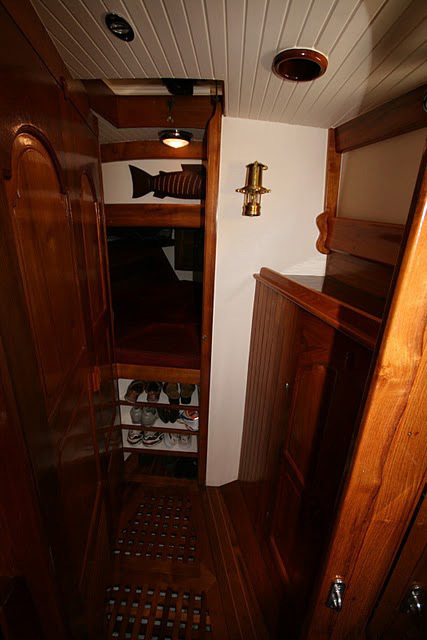 The hanging locker just aft of the v-berth. The head, across from the hanging locker. 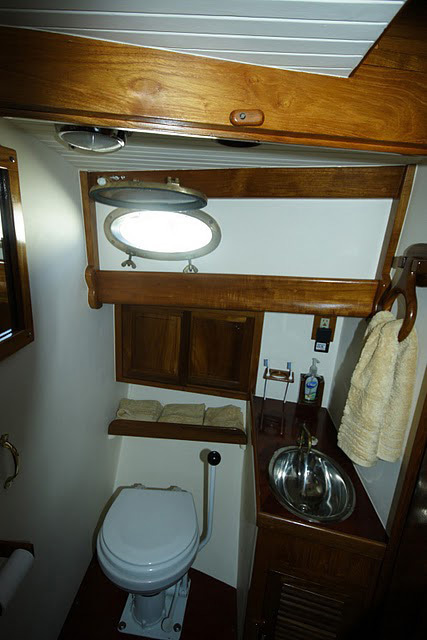 On the right side is the berth that we sleep in when we are at sea. Only room for one person, as the other is on watch. 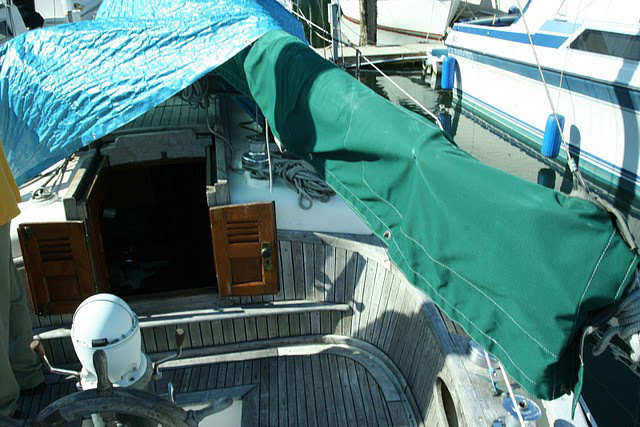 A lee cloth folds up and keeps the person from falling out when the boat is healed. 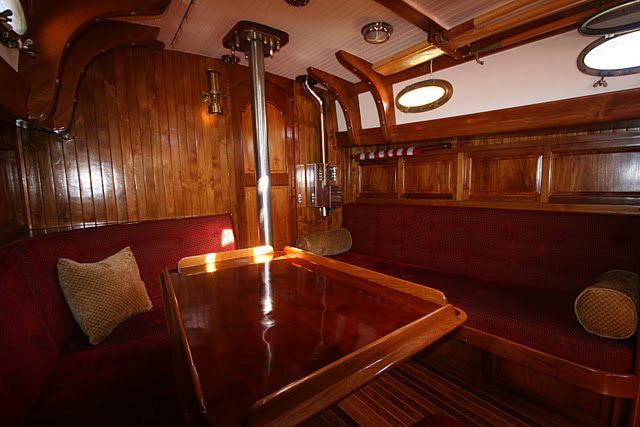 The saloon. 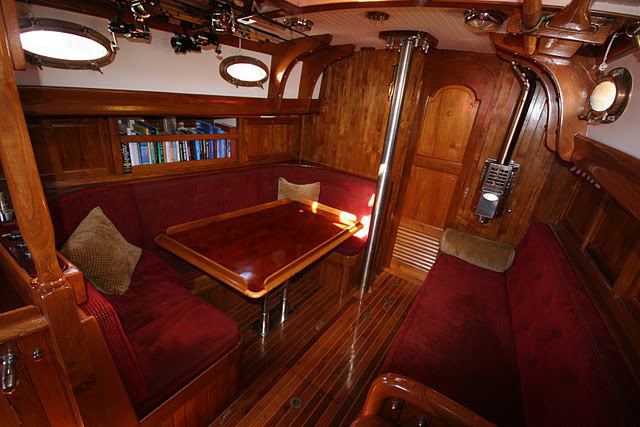 This table folds down to make another berth for guests. 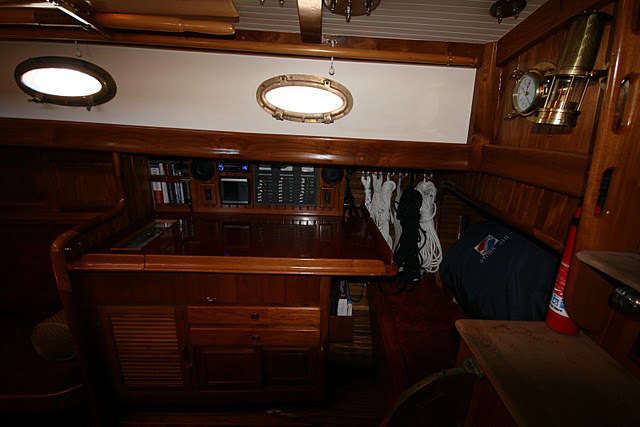 Looking aft towards the navigation table and galley. 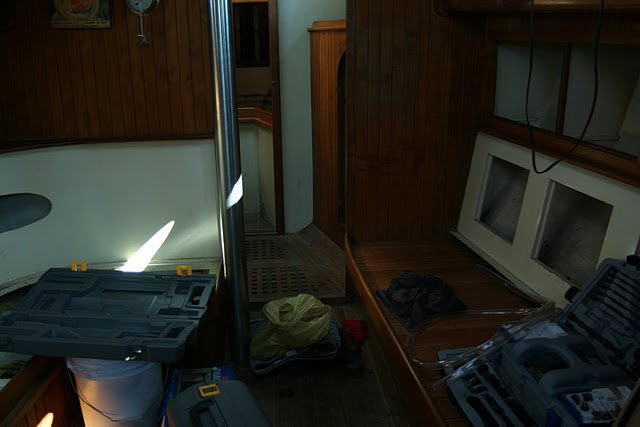 The navigation table which has the radio, GPS and all the other electronics. 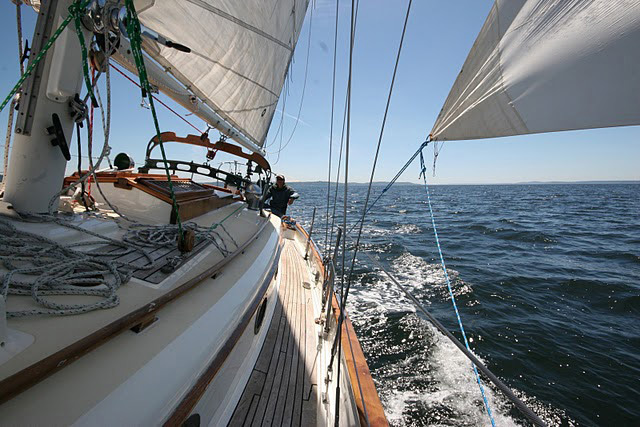 This is where we spread out our charts when we are sailing. 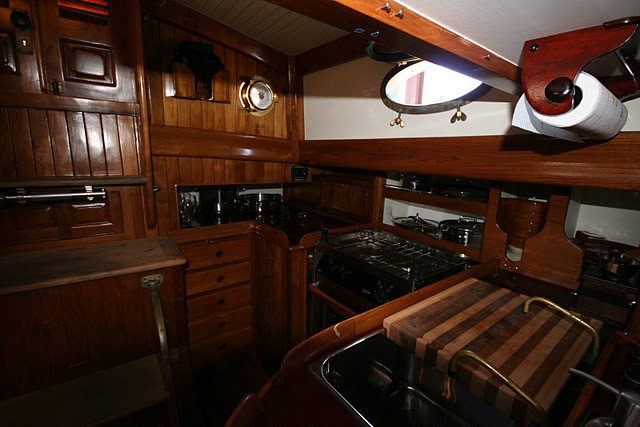 The galley with propane stove/oven, two sinks (one salt water and one freshwater), and the ice box. 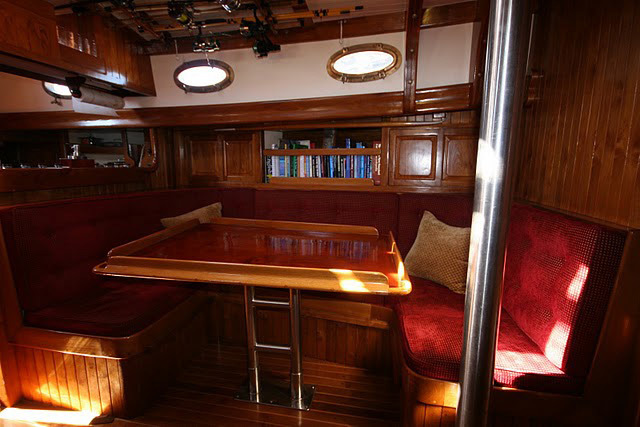 Another shot of the galley. 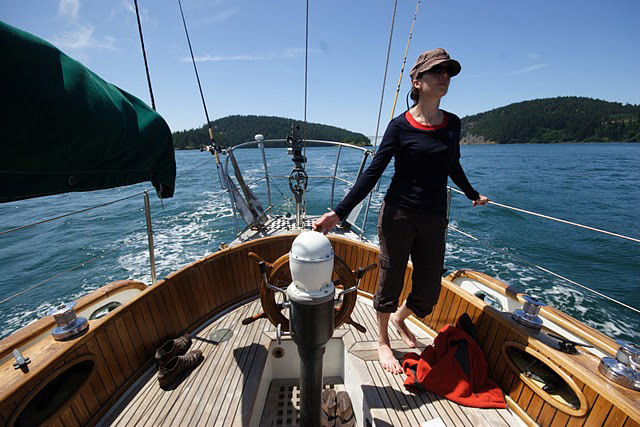 After what feels like an eternity, we're finally out on the water. 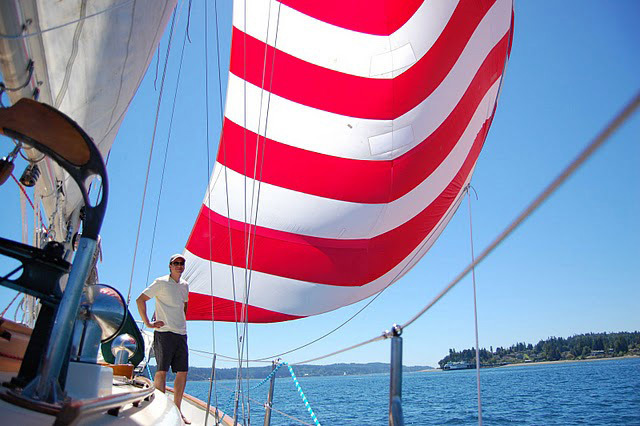 Sailing in the Puget Sound.